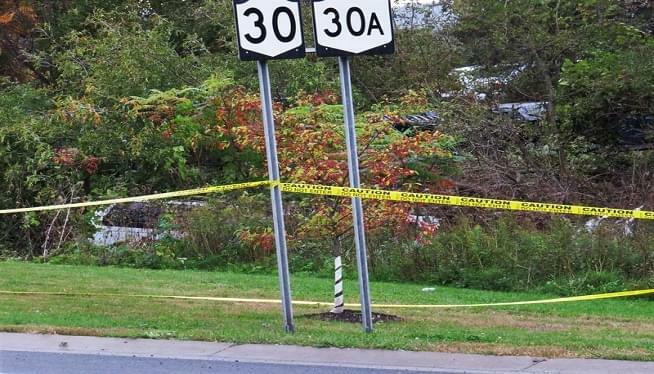 ALBANY, N.Y. (AP) — The operator of a limousine company involved in a crash that killed 20 people was arrested Wednesday, state police said. It wasn’t immediately clear whether the charges were related to the deadly wreck. Nauman Hussain was taken into custody following a traffic stop on a highway near Albany, the New York State Police said in a brief news release. No further details were released on the charges. A phone call to Hussain’s lawyer was not immediately returned. Hussain was the day-to-day operator of Prestige Limousine, and the son of the company’s owner. State police and the National Transportation Safety Board are investigating the cause of the crash, the nation’s deadliest transportation accident since an air crash outside Buffalo in February 2009 killed 50 people. The limousine ran off the road Saturday at the bottom of a long hill in Schoharie, 25 miles west of Albany. The crash killed two pedestrians and all 18 people in the limo celebrating a woman’s birthday. The limo driver was among the dead. Prestige’s lawyer, Lee Kindlon, has said that safety issues were corrected. He said the driver might have misjudged his ability to stop at the bottom of a hill. The driver’s widow said her husband had expressed concerns about the company’s vehicles. “He was in excellent health. He was an excellent driver. For over 20-plus years he drove a tractor-trailer,” Kim Lisinicchia said. The limousine that ran the stop sign was cited for code violations on Sept. 4, including a problem with the antilock brakes’ malfunction indicator system. Four of the Gansevoort, New York-based company’s limos were cited for 22 maintenance violations this year, though none was deemed critical. Even if the repairs were made, the limo would have needed to be re-inspected and the owner would need approval again to transport passengers, a state transportation department spokesman said. A vigil for the victims will be held on Wednesday evening in a Schoharie school gymnasium.